I have a few fairly random observations to get back to. First of all, what's the special property of English Muffins that makes them take twice as long to toast as, you know, toast? I have to hit the button twice on those. That reminds me of this hilariously cheapskate hostel I stayed in in Barcelona called the Sun and Moon. It WAS affordable, at about 20 euro per night per person, and free breakfast was included -- because, of course, that makes good advertising. But, really, they did not want to give away free breakfast at all, so what they did was make it from between 8:00 am to 9:00 am. At a youth hostel. In Barca. A single hour. All they had was cornflakes, white bread, milk, yogurt, butter, and jam, and a single toaster capable of fitting 2 slices of bread. For the entire hostel. And this was a terrible toaster, it took 2 whacks to get the job done on regular bread. They also charged a key deposit, even though their hostelling association claimed they didn't do that, and charged to rent blankets (I brought one, thankfully), and to use the luggage room, and to use the lockers. We stayed in a room that was about the size of a two-person hotel room in the states, meant to sleep six in bunk beds, but they'd added another two beds in the corner -- you could tell they weren't meant to be there, since the other six had a light and power outlet. But it wasn't so bad, really -- the place was clean and quiet, and since I wasn't there to party until six in the morning, that worked out. The shower was tiny, and just a single one, but it was a solo shower for the room. This worked fine, because the most people staying there during my stay was four, considering it was January. I hate to think of eight folks duking it out for the 1 WC -- though there was another solo in the common area downstairs -- but it was much cleaner and functioned better than the push-button gym showers at other hostels. Speaking of security, what's with all of these high security passcodes? I just had to register for my insurance company's website with a fancy unique password, and that's I guess okay, but then my time clock at work did the same thing. I went from a password of "1234" to "123456aB," because I am required to have at least 8 characters, including capital and lowercase letters AND numbers or special characters. And, yes, I'm publishing the password, in full, on the internet, because I DON'T CARE! Someone might, I recognize, HACK into my account and clock me in early tomorrow. I may have to ask payroll to clock me in at the proper time manually. The horror. US Bank is the only place that I've seen whose security regulations make sense. What they do is have a SEPARATE page for entering username and password, with a secure load between them. Fail, and you are kicked out of the website entirely. That way, a bot cannot sit there trying lots of combinations. They also have a sign-countersign type of response, where THEY provide YOU with a password and image, unique to you -- this way you can't have a phishing scheme trick you into entering your password into a dummy site. I'm sure I have something else in mind, too. 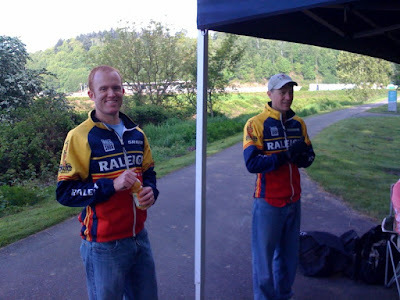 Matt and Paul, Avenir Parts and Accessories Extraordinaires, handing out coffee and Clif bars! And here's Monette and Alexander, cooking up a delicious storm. Thanks! My coworker Karl and I have been commuting into work by bicycle together at least a couple of times a week in the past month, and he's carpooled me home a few times, too. He also sits one desk over, eight hours a day. This results in entirely too much time spent in one anothers' presence. Witness this e-mail I just received from the man. It's one big inside joke. T: Hey Karl hows it going? T: FWIW, you are a f-tard. K: Okay. What is a f-tard? Do you know? T: Someone who eats meat. T: Noob. U r 901ng 2 g37 pwned 1F u 3\/4R m0\/e 0u7 ()f Cr45|-| 6. T: What did you have for dinner last night? K: Pattes de Grenouilles with Foie Gros and Escargot on the side. K: What about Team Bbox? 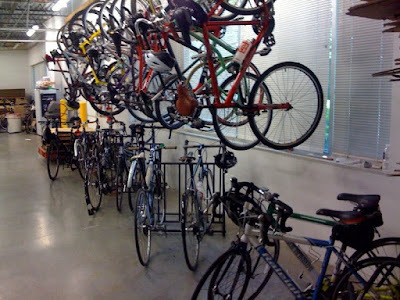 I'll admit that the whole idea of Widget Awareness Week and National Fnord Day is a little silly, but May is alternatively Bike to Work Month or Bicycle Commuter Month or just plain Bike Month or what have you, with either last Friday, this Friday, or Next Friday described as "Bike to Work Day." Raleigh America, my employer, will be participating in the Cascasde Bicycle Club's Group Health Commute Challenge, as well as a bike commuter dealio called the Rush Hour Revolution. If there's one thing I would ask of you to do, it's -- hrm, no, the ONE thing I'd ask you to do is get on your bike. 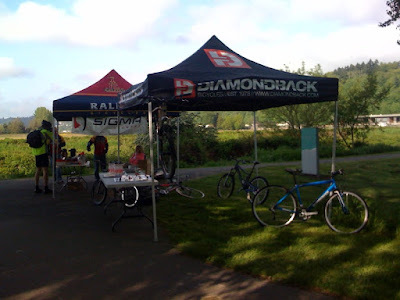 The SECOND thing I'd ask you to do, though, is this: Ride your bike to work on Friday, May 15th, and send a quick note to Starbucks about the Bike to Work day that they sponsor. You see, even though SBUX pays some tax-deductible advocacy cash to the CBC, which is cool, what they do not actually do much to support people commuting by bike to work at Starbucks. Yep, I worked at the large, Seattle-based coffee corporation for a time, and rode my bike to work there. There was indeed a bike rack in front of the store I spent the most time at, but that's because the strip-mall complex in which the SBUX was located decided to install racks at regular intervals throughout the complex. Huzzah for them. But most Starbucks don't have bike racks, and when I asked "Mission Review," a sort of internal ethics helpline, about the matter, they suggested that they'd looked into it and found that each "staple" rack would cost the company $80-something, plus installation, which wouldn't be too bad, since Starbucks has in-house facilities staff. Decisions to install the racks, though, were not something they were willing to make. Contact your local district manager and facilities coordinator, blah blah blah. Each lease is unique, location, blah blah blah. Nonsense, Starbucks. Nonsense. Bike racks are cheap, easy, Hollywood Video can hack it, you can. I get that SBUX's within larger office buildings might not have control over their own sidewalks, but there's no reason at all that that company cannot have, as a policy, that a bike rack be installed at each Starbucks where it is feasible. Say, each location in which there is outdoor seating available. It'd be a good start. After that, of course, having some kind of locker space available to keep my bag and stuff would've been nice (everyone's clothing and jackets were just lumped in a pile in a corner,) not to mention that I had to change in the single bathroom available to both employees and customers, but, so it goes. 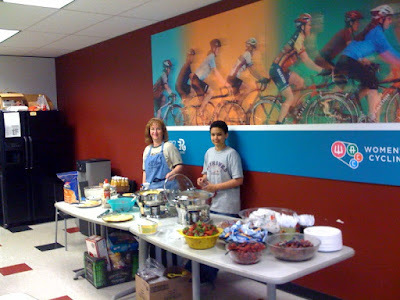 Anyway, I know most companies in corporate America haven't jumped on the bikes-are-awesome bandwagon. But Starbucks gives it some lip service and a bit of wallet service. The CEO is pictured in Starbucks cycling jerseys, fer Merckxsake!